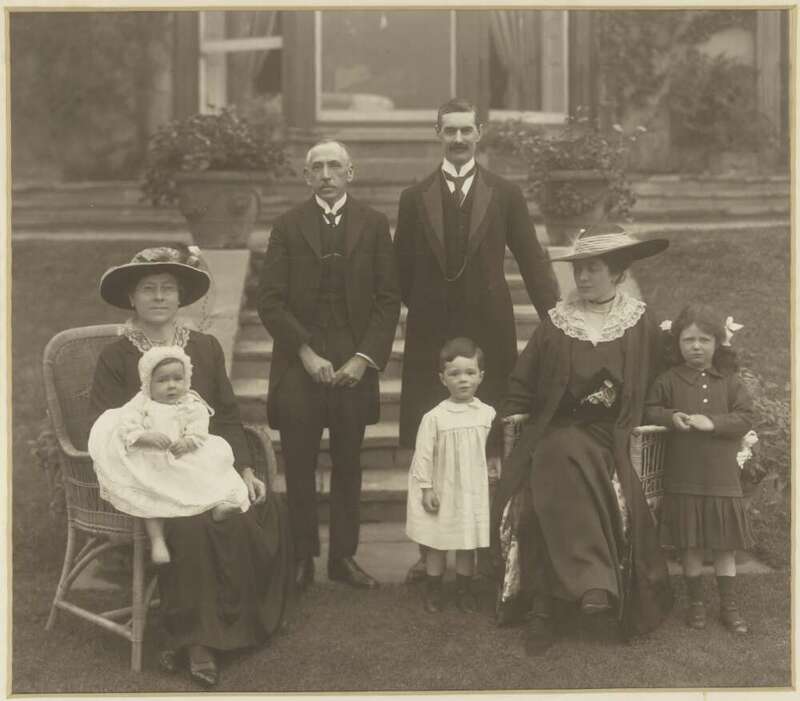 On 31 July 1916, Prime Minister WM Hughes returned to Australia (Fremantle) after six months in Britain and Europe, where he had raised Australia’s profile in Allied war councils. He spoke at the Melbourne Town Hall on 8 August. In the speech (one of a number he gave after his return) can be seen hints of where Hughes took Australia in the next few months, although crucial details were still to be settled. ‘We are proud of you’, the Victorian Premier, Sir Alexander Peacock, had said to the prime minister, as Hughes’ wife and young daughter, Helen, many dignitaries and 50 Anzacs milled around the prime ministerial train at Spencer Street station. Most members of the federal Labor Cabinet were present, along with a collection of Victorian politicians. A crowd of 5000 people thronged the footpath outside the station. Three cheers rang out, Mrs Hughes was presented with a sprig of wattle and a basket of flowers and the prime minister with a model of the cruiser Australia, also constructed with flowers. Baby Helen, in the arms of her nurse, had been regarding the flurry around her with the utmost indifference, but she became interested when the photographers got to work, and looked femininely proud when, with a sprig of wattle in her hand, she was held high in the air by her father to be “taken” for the moving pictures. Hughes avoided directly raising the possibility of conscription but one of the warm-up speakers, Peacock, made a point of recalling that Hughes, before the war, had strongly supported compulsory military training for boys and ‘we were grateful for the seeds he sowed then’. The Defence minister, Senator Pearce, who favoured conscription, spoke of Hughes’ ‘triumphal progress’ since his return to Australia. Hughes, Pearce said, ‘might rest assured that, whatever sacrifices he might ask of the people in the future, he would have the Commonwealth behind him’. Loud cheers followed. Conscription had been a live issue at least since the War Census of September 1915. Meetings pro- and anti-conscription had been held in a number of places in Australia in the days before Hughes returned to Australia. Anti-conscription meetings were being broken up by the police under the provisions of the War Precautions Act. Returned soldiers demonstrated in favour of conscription. The pro-conscription Universal Service League was holding regular lunchtime meetings in Martin Place, Sydney. When Hughes returned to Australia, the Labour newspaper, The Worker, greeted him with the hopeful words ‘Welcome Home to the Cause of Anti-Conscription’, though some anti-conscription people were convinced that Hughes had been successfully duchessed by pro-war forces at home and abroad. 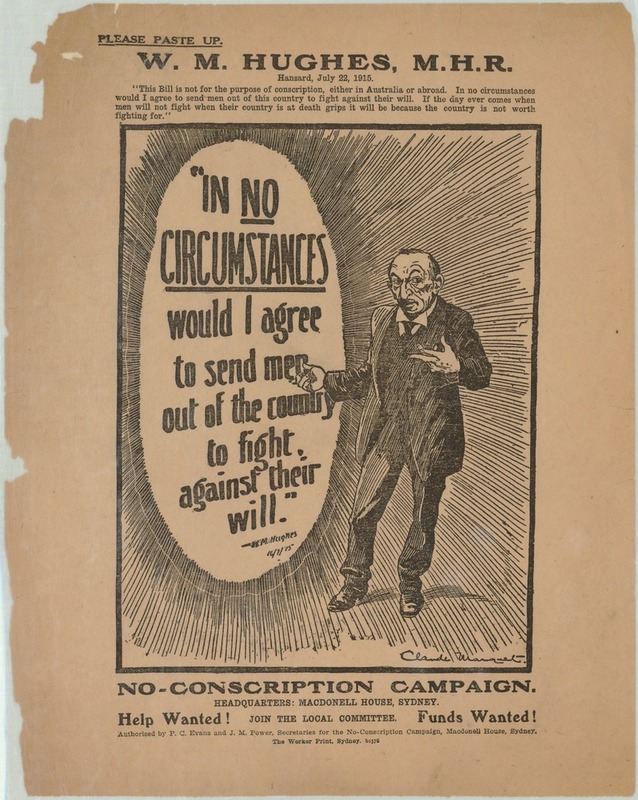 In the early days of August, Labour councils in a number of states had passed resolutions against conscription. ‘During August, 1916 [wrote LC Jauncey 20 years later] the one question in Australia was “What will Mr. Hughes do?” He had been making speeches in different cities in the Commonwealth, but carefully refraining from committing himself to any set programme.’ In Adelaide, the day before Melbourne, he had hinted a referendum might be held, though the Adelaide paper, The Critic, referred to the ‘studied ambiguity’ of all Hughes’ speeches since his return to Australia. Almost all his associates, including his defence minister (Sir) George Pearce pressed the need for conscription, and he was not fully aware of the strength of opposition within the trades unions and the Labor Party. He had returned half convinced of the need for compulsion and wholly determined to give the troops at the front whatever reinforcements they needed. It is a curious circumstance, and a significant one, that while the capitalistic papers [like The Argus] are slobbering over William Hughes, and hailing him on his return from England as though he were a bright god stepping from a star, in the very same issues they are assailing with a poisonous malignity the Movement that brought him into being. These interests knew they could not pervert the Labour movement, said Boote, but they reckoned they could seduce Hughes. Boote quoted Hughes in July 1915 denying any intention to conscript men to serve overseas and concluded: ‘We do not believe that the William Hughes of to-day intends to scab upon the William Hughes who gave that definite pledge to Australia only a few months ago’. Others were on the case, as well. Hughes’ parliamentary colleague, WM Higgs, wrote to the prime minister on 12 August, saying that ‘Conscription will, in my opinion, split the political labor party into fragments’. In New South Wales, however, Premier WA Holman was strongly pro-conscription. Higgs and Holman represented what was becoming a deeply divided party and movement. While Hughes may have been unsure of where he stood in relation to his party and the country, The Argus, speaking for the conservative forces, had no doubt, reporting on the rapturous applause of the Town Hall audience and averring that ‘Mr. Hughes never enjoyed greater popularity than he does at present’. To The Argus, conscription was the inevitable (and popular) implication of Hughes’ talk of the need for sacrifice; Hughes may not have been quite at that point but there were plenty of people pushing him towards it. As the prime minister’s car swept away up Collins Street, the packed crowd shouted, ‘Good boy, Billy Hughes’, and cheered lustily. * Donald Horne, The Little Digger: A Biography of Billy Hughes, Macmillan, Melbourne, 1983, p. 76. The other material here is taken mostly from the 9 August edition of the conservative Melbourne newspaper, The Argus, and from Joan Beaumont, Broken Nation: Australians in the Great War, Allen & Unwin, Sydney, 2013, ch. 3, and LC Jauncey, The Story of Conscription in Australia, Macmillan, South Melbourne, 1968; first published 1935, ch. V.